These income reports attract a lot of new readers, so in case you’re new around here, a quick intro: I’m a freelance copywriter and content strategist who has been self-employed for 8+ years and traveling the world full-time (working mostly from Europe) for about 7. Reports like these are where I share how I make money while traveling the world, how I find clients, etc. etc. This quarter (Q1 2019) was a really great one. I’m working with a big client I love. I signed another super interesting new client. I’ve been getting lots of work requests, which means I’ve been able to pursue projects that really resonate with me and confidently turn down (and pass along to other writers and consultants) those that don’t. I even had a client offer me a full-time job. And while that isn’t the right move for me at this time, I am still deeply flattered that they enjoy working with me so very much. My very first job in high school was editing a newsletter, and I’ve been pursuing professional writing ever since. These days, I have almost 20 years of content work under my belt since that first gig. I’ve been fully freelance for about eight years now and copywriting and content strategy is still my strongest skill set and the primary way I make money, even though I dabble (as you’ll see) in a few other related things. This quarter, I’ve started moving away from doing full start-to-finish websites or helping with coding/Wordpress. I’m still doing a little bit for existing clients, but I’ve been turning down new projects and since my content work is both more lucrative and more enjoyable, I think this percentage will continue on a downward trend. I’ll still lend my tech, design, and other web skills to my ongoing clients, so they never really disappear, but at this time, I’m moving away from anything that requires a lot of tech troubleshooting. A few years ago, I authored a series of travel guides for destinations like Switzerland and France. At the end of the day, they didn’t feel lucrative enough to continue churning out, but the good news is that books are a long-term investment. You put in the time and they keep on paying you as time goes on. They aren’t a huge source of income for me, but it’s always nice to have a little extra I can count on every month (especially in slow months or during vacation when I’m not actively putting in billable time). Irritatingly, my publishing platform made a big change in Q1 and didn’t communicate it well, so I had a month or two of steeply dropping sales before I figured out that I had to actively go through the new platform and re-approve my books for publication. My March income was pretty average for the books, but there were some issues with the January and February income levels. I’ve been blogging since my teen years, but the truth is that it was never about money. In fact, until last year, the blog really hadn’t made any. I blogged because I loved it and because I thought it was helpful and because it benefitted me in other ways. But last year, I tried something different. I joined an ad network halfway through year. I wanted to see if A. people would be bothered by the ads and B. I’d actually make any money. I didn’t get my first check until the fourth quarter of the year (ad networks take 2 – 3 months to pay out), but was delighted to find that I’d multiplied my average blog earnings by about 2000% (if I’m doing that math correctly), which is kind of insane. I love to travel and I do so full-time, so it only makes sense that I occasionally do some travel writing. These days, I don’t seek it out, but this quarter I had three editors reach out to me (two I’ve worked with before and one who’s new to me) to ask for pieces. I had the time and was happy to oblige. Some of the income is already in, but most of it will pay out in Q2. As some of you may know, this year I’m doing an experiment. I’ve started a new blog from scratch and am working to see if I can make it profitable by the end of the year. In Q1, it was all work and no payoff (which is absolutely what I expected), but it’ll be interesting to see if it becomes an income stream by the end of the year. I was very low key on my new business activities this quarter. In part, this is because the first week of the year was vacation and it took me a while to get back into my work groove when I got back. And in part it was because my workload is close to capacity. I was waiting to hear from a new potential ongoing client (now signed and started work in March! ), was working on big projects with my other big ongoing client, and had a small avalanche of referrals come my way without me doing a thing (hoorah!). And with all that flowing in, I’ve been in the happy position of cherry picking the best client fits and turning down work that was less of a good fit. So while I did keep an eye on my industry groups and reach out if anyone needed help with something I was well suited for in the early part of the quarter, beyond that I didn’t do anything sales-wise. I also have two leads (one a big ongoing client and one an agency that may have a smattering of projects to throw my way) that I think are likely to come through in Q2 if I have room for them (all depending on how the workflow shakes out with my current clients). Savings: Did I Hit My Quarterly Goals? As you may already know, last year, it was my very aggressive goal to save 50% of my income over the course of the year. This was before taxes and included both retirement savings and emergency savings. This year, I’m taking that goal two steps further. What if I could save 75% of my income before taxes? Does that sound crazy? It probably does. But I get excited about difficult goals and I find it fun to try and see how much I can save, so I’m going for it. Especially since so far this year is looking so good for business. It took a long time to get here, but I’m currently earning the most I ever have and my business is feeling very established and comfortable. So why not set a crazy goal and see if I can hit it? As a freelancer, I don’t have access to employer-run retirement programs or savings matching. And I can’t say I have any faith that government programs in the US will be around by the time I leave the workforce. So if I want to retire, aggressive savings goals are going to have to be part of my strategy. So, that said, how did I do in Q1 on my goal of saving 75% before taxes? Surprisingly well, considering my very expensive February and a rather hefty pile of dental bills from March. I exceeded my goal by a couple percentage points, coming in just under 77%. Keep in mind that this is all based on a part-time work schedule. After a pretty epic illness a few years ago, I realized I couldn’t work full-time and take care of my physical and mental health. My hours have varied since then, but I generally shoot for a half-time schedule of 15 – 25 hours per week (generally running a little high in winter/Q1 and a little lower in summer). For Q2, I’m planning to increase my working hours (more on that in the Q2 report), but in Q1 I was still part-time. It’s also worth noting that I’m not counting the time I’m working on Vicious Foodie in that part-time schedule. Right now, that’s mostly a side project/passion project and I can choose to do as much or as little as I like (a factor that shifts with my health and passion on any given day and the weather/how many other things I want to be doing). This is something I’ll be working much less on in Q2 as I increase my working hours on billable projects. As you know, my business is location independent. Which means I can work from anywhere in the world as long as I have a laptop and a good Wi-Fi connection. 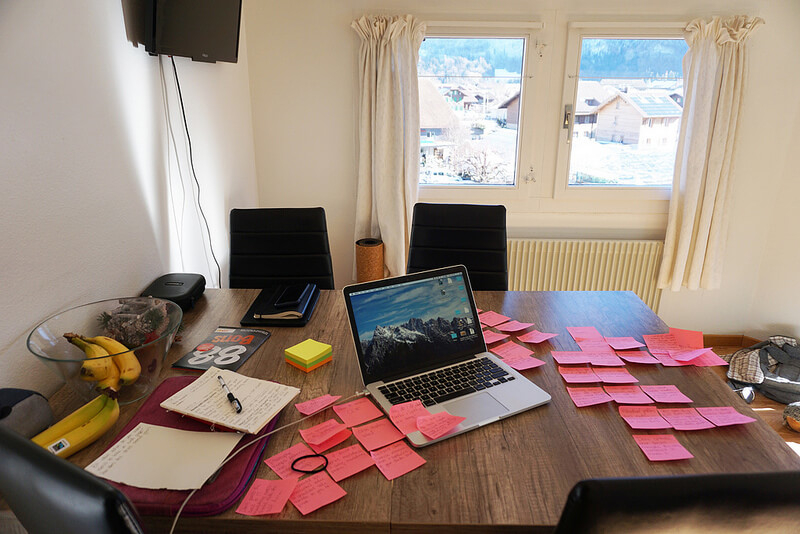 This quarter, I started out in Interlaken, Switzerland, where my primary workspace was our very sunny living room with a view of the Alps (pictured above the post). In mid-February, we moved on to Italy for a few days, then Georgia (the country). And finally, with a quick stop in Vienna, Austria, and then Zagreb, Croatia, we finished up the quarter in Split, Croatia, on the coast. 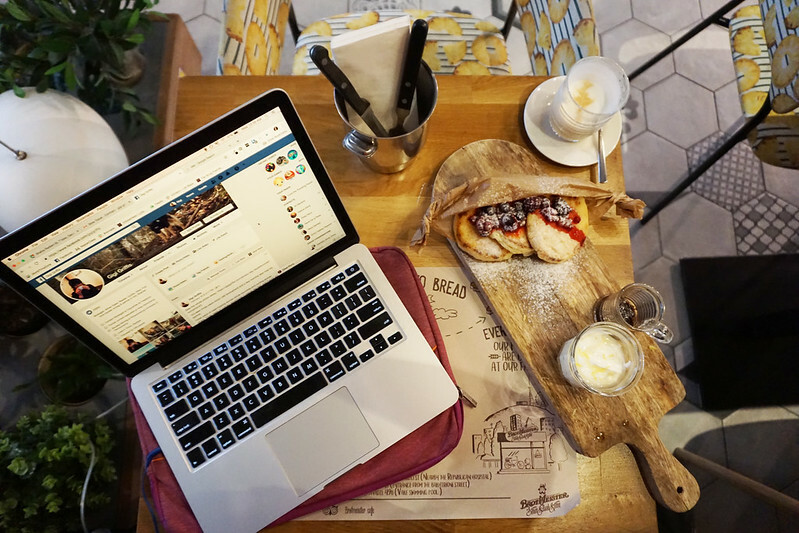 Working in a Tbilisi cafe. As of this writing, my schedule is full. But you never know when things will change and I’ll have an unexpected opening (because, hey, that’s freelance!). So, if you need someone like me, please reach out. Tech businesses I’ve worked with include Dell, BestVPN, ComplyData (oil and gas compliance software), miiCloud (face recognition software), and Lytics Customer Data Platform. Healthcare clients have specialized in orthodontics, dentistry, vein care, and sexual health. And agency clients have included Atlas Advertising, Fractl (the infographic masters), and Cowlick Appeal. Congrats on an awesome quarter! I’m so happy for you that things are going so well! Congrats on being booked up! Gigi, when you’re more focused on finding new clients/work, what percent of time do you think you spend on prospecting? I am currently focusing on learning more strategies for keeping everything organized and accessible (cause I have lots of photos and client files). I’ve recently had a very discouraging problem where all my smaller plug-in external hard drives have stopped functioning well with my laptop and eject constantly. 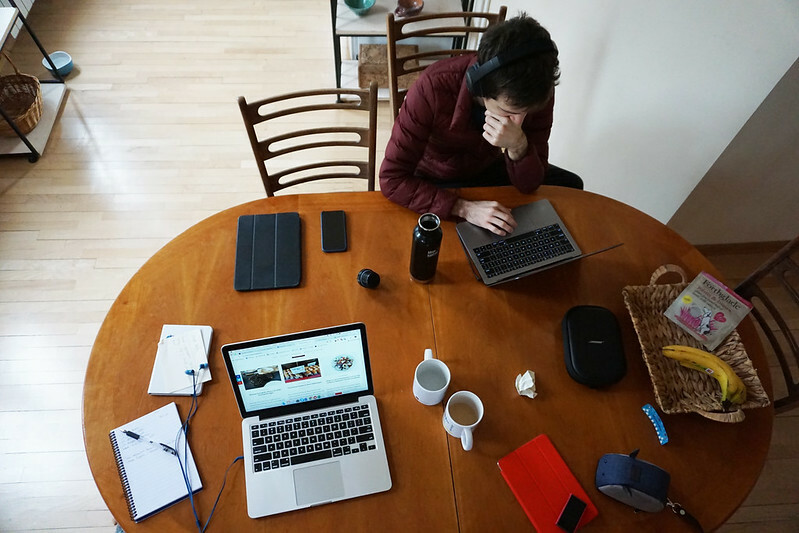 I was curious, since you’re a nomad and freelancer, how do you keep your information where you can access it? It really depends. Last year when I was hitting sales really hard, I was probably spending 2 – 5 hours per week for a few weeks, but usually it’s not that high. I find there are only a handful of sales tactics that really work for me and there’s only so much time I can spend on them before they get redundant (checking gig listings in my Facebook groups, for example – people only post so many things per day, so there’s a limited amount of time I can spend on it before I’m looking at duplicate listings). Re: files – I have everything stored on my computer, removable hard drives, and in many cases backups in my email or Google Drive.